I'd like my earth-like world to have a naturally formed narrow strip of land that bridges a major sea. Now, before anyone rushes off to comment about island chains and land bridges, I'll add that I'm looking for unusually long, thin, and well, road-like formation. The thinner the better. The ideal would be to form something like an actual road, approx 5-15 meters wide. Recognizing that this seems very, very unlikely, I'd still be happy with answers that helped me form a landmass as thin as a few kilometers. The road should be shaped like a curved line. Thankfully, nature makes this is a lot easier than a straight one. The road should span between 500-2500 km. I'm still working out the distances of my world, but this is a probable length for the sea in question. Being able to scale an idea up or down a bit would be a very good thing. The road can be irregular. It can widen and narrow, rise and fall, so long as it retains a basically long and thin road-like shape. The road does not have to be unbroken. The easier it is to walk the better, but small gaps are fine, so long as they can be crossed by bridges or ferries. I'd like there to be no more than a few large gaps, and none larger than approx 30 km. (Taking a cue from the English Channel.) That said, if a motivated ancient empire with good engineers and durable concrete could make it work in the long-term, then it's good. To start, relevant here is Adam's Bridge, a now sunken 50km long and 1km wide land bridge in southeast asia. There is much confusion as to its origin. Moving on, I'd considered a number of possibilities for how to form this, but I'm learning as I go and don't know enough about to weigh or implement them. This included continental drift, underwater mountains and tectonic plate action, etc. My favorite idea was to make the road part of the rim of an enormous crater. If it worked, this would fit my world really well, as impact events are important to the mythology of the terrestrial culture. The Kwajalein Atoll is one of the largest in the world. Following the curve of the land, I estimate that the distance from the upper left to bottom right corners of the atoll is about 104 miles, or 167 km. The straight line distance is more like 75 miles or 120 km. The width of the atoll is in the range of 500 meters for most of its length, with occasional thickened points that you can see. Despite the enclosed water area of 2174 km$^2$, there are only 16 km$^2$ of land area. Your best bet to get up to 500 km is to either have one mega-volcano which later sank under the sea leaving a very, very large atoll, or a chain of smaller ones that formed at roughly the same time, leaving a chain of atolls that are within at least visual distance of each other. would fulfill all your requirements. The first example is a bit shorter than required (~35 km), but the remaining ones measure almost 100 kms each. Usually, such formations are in moderate flux, and can occasionally become disjointed islets (but I understand that you're OK with that). The only (but major) caveat is the aforementioned requirement for some sort of sand deposition process (as you can see, all examples above are relatively close to land). You might want to tweak your geography so that your points of interest across the major sea do not require it to be smack-dab in the middle of the basin. You could use a large mid-ocean ridge, like the Mid-Atlantic ridge, and then play around with sea levels. Mid-ocean ridges occur at (divergent) plate boundaries, and can be thousands of kilometers long. They can rise high above the sea floor, at times breaking through into islands. Take a rather large plate boundary and start some dramatic seafloor spreading. Then, lower sea levels rapidly across the planet - not too much, but enough so that the peaks poke through in places. kingledion suggested that an extreme ice age, followed by rapid melting, could expose the ridge, which is a good idea. Enjoy your natural road! It could end up taking you not just 500 or 2500 km, but halfway across the planet, if you want. Image in the public domain. Credit: US Geological Survey. All the answers seem to be focusing on using geological methods. For a completely different natural methodology consider the possibility of long chains of floating colonial sea life forming your roadways on the sea. Some hybrid between coral and jellyfish possibly in symbiosis with sea weed plants or other photosynthetic algae. 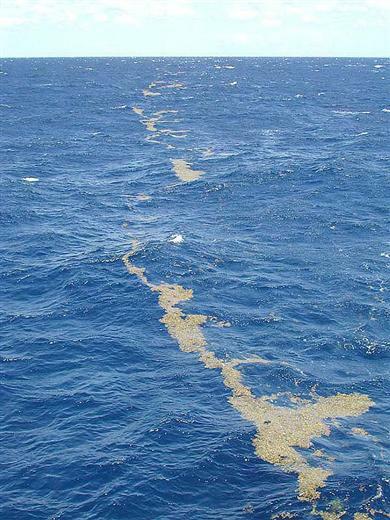 Floating Sargassum sea weed chains can be miles long as pictured and coral growth can build islands in shallow tropical seas. These organisms are often colonial forming close groups or chains, your world might have a variant that forms very long chains that are thick enough to walk on or use as a roadway. These sea roads could be anchored and fixed in place in shallower seas, linked between islands in an archipelago, or may drift to some degree. As natural formations they may branch, dead end, or otherwise change over time. They could also potentially be cultivated and maintained by people who want to use them as roads. Your bridge could have been caused by a pre-historic meteor impact like the Chicxulub crater. Meteors push earth up around the point of impact. Depending on the type of dirt involved in the impact, the more shallow areas could conceivably form a curved land bridge where the deeper-side of the impact would have been entirely lost to errosion. I was looking at the link @Era provided in the comments below and it produced yet another idea (way to go @Era!). Let's a assume a massive volcanic caldera with strong basalt deposits in the outer ring but porous pumice or lava rock in the center ... something that can be eroded over the millenia. This would probably be unbelievable for 2,500Km, but could be believed for 500Km (bigger would require a tectonic ring of fire that subsided, allowing the surrounding ocean to flood in). They can create long thin islands and chains of islands. They can be massive and they solve several other problems. 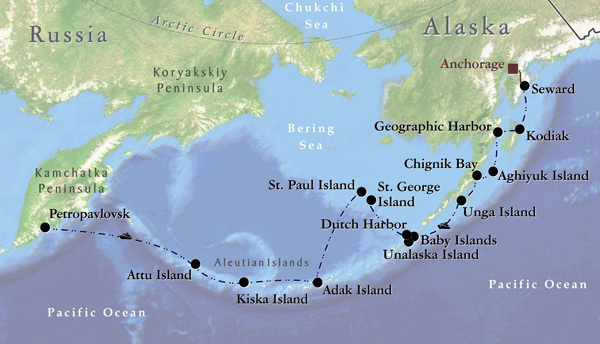 Just look at the Aleutian island arc in Alaska and Russian (Aleutian and Commander Islands), they nearly cross the ocean they are well within your length range (~2000 km). they are created by a subduction zone. Add in Kingledons' idea about coral reefs and you could easily end with something buildable, If they were not so far north they probably would already support a near continuous coral reef, the land height is good for it. It is already possible early people hopped across these on boats to reach North America. 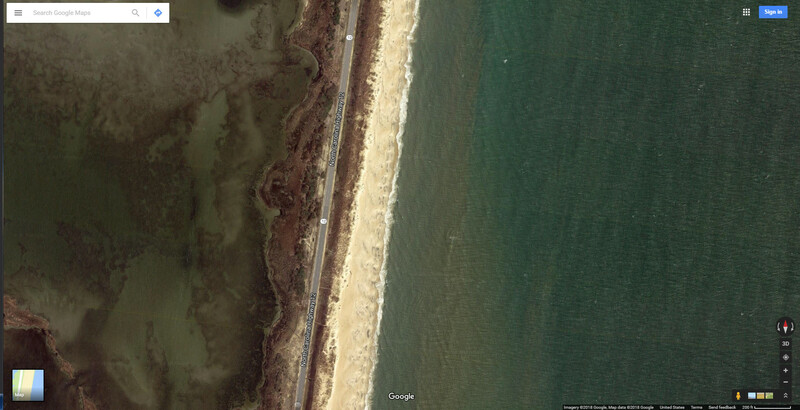 If sea level dropped exposing the reefs you could easily end up with a continuous or near continuous land-bridge. Note it takes care of several other requirements as well. people live on many on the Aleutian islands even though they are earthquake prone so they are easily stable enough. The arcs are always curved (or have multiple curves) due to the forces involved but the amount of curve varies, so that solves another requirement. You can cross from one continent to the other without ever going below 182 meter with present sea level, (thanks Gerrit) so drop sea level just to the last minimum (20,000 years ago) and you can cross without ever going below 62 meters and that is by far the worst stretch (the part with the deepest high line right near kamchatka), the vast majority of the chain would end up above the water line. so you have one or two short ferry trips and you are on land. And that is just for an existing example on earth, you could easily make one that suits your needs and is believable it has happened in earth's past, . You will still have at least one gap, likely more but that is just water pressure and tides at work, you can even reduce this if your chain is parallel to the tides. You can easily end up with something that can be crossed by modern bridge building technology, or primitive technology combined with short boat rides. Malaysia and indonesia would be another good example to look at. 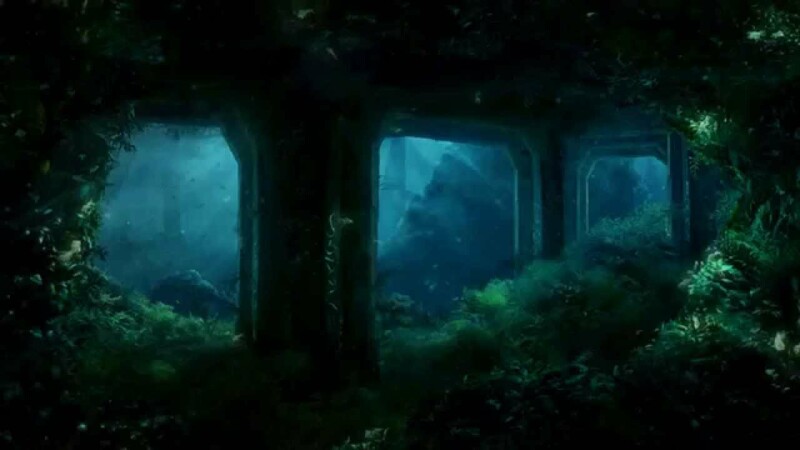 source One of my favorite things in the Lovecraft stories is when they come across prehuman ruins. Mountains of Madness is one of the best but it is a recurring theme: cyclopean, impossible constructions which have weathered the ages because of their preternatural hugeness. So too your road. It is a built thing, of unknown antiquity. Sort of like the Roman roads must have seemed during the middle ages - or maybe more like the Giants Causeway. In places the traveler on this road will encounter other ruins visible below the water and extending downwards - presumably made by the same builders. In some of the constructions made by humans along this ancient way, the basements of the buildings make use of lower, deeper constructions encountered during the building. Some of these deeper pieces might be used as foundations. A natural road cannot form across a large sea. I admire the creativity of the other answers, but I'm going to answer that it won't work. 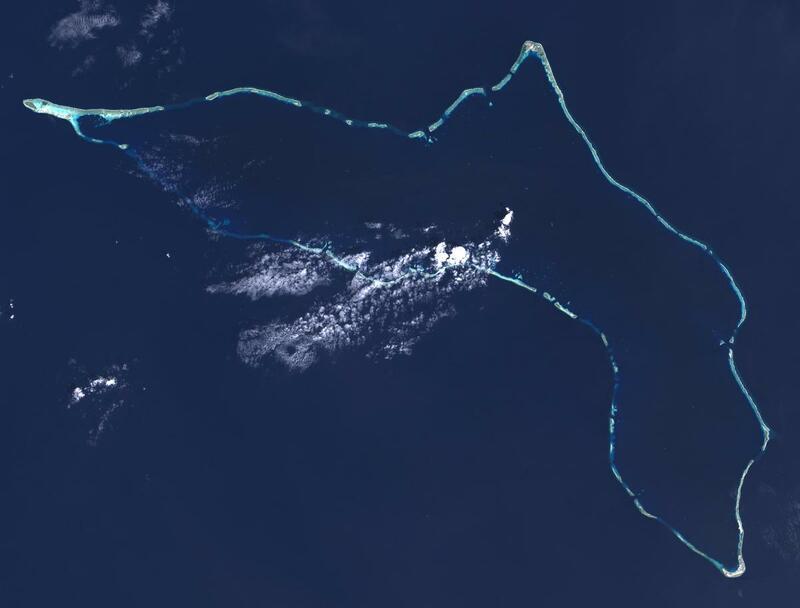 Atolls form in shallow seas. Splits form in shallow seas near the coast. Mid-oceanic ridges form in the middle of the ocean and never across a sea, and their crest is too rough to be reasonably called a "road". Whatever its origin, Adam's Bridge mentioned in the question is in a shallow sea, too. Aleutian islands. Source: Wikimedia Commons. however, I'd consider it a stretch to call this a "natural road" with small gaps. The mountains are pretty high above the water (or erosion and weathering will submerge them soon) and therefore many more than a few kilometres wide. You may be able to reduce the gaps but only so much. Realistically, you'll end up with a peninsula like Kamchatka, not a "natural road" that is at most some kilometres wide. It won't be as narrow as an atoll or a split, not in the deep sea. Just off the coast of North Carolina (USA) is an island that has a lot in common with what you're asking for. This is Hatteras Island, a gigantic pile of sand that is about 50 miles long, but only a few tens of meters wide in the narrowest spots. Most of what I know is because I have family on the island, so I don't have a good understanding of the science behind how such a thing would form, but I'll try to detail all I know and can find quickly here. The island is made entirely of sand and sea shells, and is pushed around by the Atlantic ocean currents (especially the Gulf Stream, just off shore). There is no naturally occurring rocks (according to my family, I can't confirm this). You can see an example of a narrow spot in this Google Maps image. The strip of land just north of Buxton is the narrowest I can think of. Just East of Highway 12 is a large hill running the length of the East coast of the island. Barges dredge up sand and dump it all there. If you stand on this hill on that strip shown in the link, you can easily see both shores. Its weird to think you can walk from the East coast to the West coast of an island 50 miles long in less than 5 minutes. The whole island isn't like this, though. Much further North in Kitty Hawk (where the Wright Brothers had their first powered flight in 1903) is much wider, though it maxes out at <5 miles. I don't have an exact figure here. There are also a few spots, further north, that are not connected year round. Past hurricanes and storm surges have blown through the sand completely, and whether the north and south half of the divide are connected depends on whether it is low or high tide. Bridges have been built over these areas. While the exact borders of the island are always changing, the existence of the island seems to be stable. 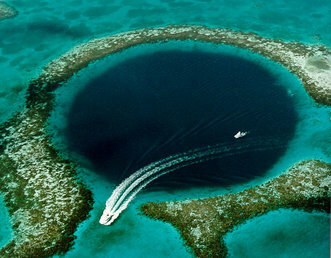 It has been continuously inhabited since before the days of European settlement in the Americas, and according to this source talking about the formation of barrier islands, it seems like the island has existed for thousands of years. I don't have time as of writing this to look up a detailed explanation of how barrier islands form, but I'll be happy to link to one if someone else can find it. New islands and features of the shoreline come and go. A new tiny island formed from 2016-2017, with the bulk of it happening in only a few months. This gives you lots of options for temporary land masses and shoreline features. Despite this, the sand is safe to build on. Several towns exist on the island, though many buildings (mainly houses) must be raised up on stilts so the hurricane floodwaters can go under them. There are buildings a few hundred years old that have been lost to the sea due to the changing shorelines, but if you build far enough from the shore in the thicker places, you can expect the building to not be washed away for decades or centuries. It does differ in a few key places from what you're asking about though. It is 1/10th the minimum size range you ask for, and I don't know how much the concept of barrier islands can scale up. The chain of similar islands connects at both ends to the USA, and seems to rely on having an ocean on one side and a relatively calm and closed off body of water on the other, so it wouldn't be good for bridging two continents as you want to do. It might work as a practical bridge if the route from start to end on the mainland has a difficult obstacle, such as mountains, a wide and fast river, or a gigantic swamp. It would be hard to have a paved road without modern technology, as large dredging boats are used to protect beaches, towns, and certain sections of island (including the main road) from erosion. There is no reason the route can't still be used though, as people lived on it for hundreds of years before a paved road was built. 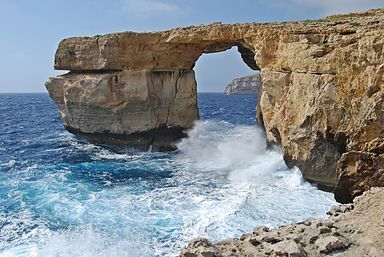 Two separate seas eroding a narrow connection between two landmasses over time could create something like this, particularly if the connecting land is a softer rock. I'll preface this by saying it may be a little farfetched; I'm not an expect in geology by any stretch. Imagine a large basin sitting below sea level, but barred from the nearby ocean by a natural dam. Over time, the dam develops a number of breaks from the constant pounding of the tide, allowing rivers to form across the basin. Over more time, erosion eats away at the softer layers of rock in the basin. In a fluke of geography and volcanic activity, the resulting formations create a series of natural arches that can be strung together with some ingenuity and excess building materials. Eventually, the wall holding back the ocean breaks, flooding the basin. We're then left with all the arches that appear to be small strips of land above and below the surface of the water. It might be a bit of a stretch to suggest it created a path that long, but the process that is believed to have formed the Galápagos islands would probably work. Basically there is mantle plume that is stationary beneath the tectonic plates and the heat from this plume creates volcanoes above it which eventually become a chain of islands. Given long enough this chain of islands could stretch right across a sea or ocean. It wouldn't be anywhere near as thin as you want, but you could use erosion and maybe a sea level rise if you really wanted to make it quite narrow. As for the science... the downside is that the Nazca plate which the Galápagos islands are on is estimated to move 5cm a year so to reach your minimum of 500km you would need 100,000 years for it to form. Not exactly a long time in geological terms, but a long time for the plume to be active and for nothing else to happen to break or disrupt the chain of islands. A long time ago two continents merged in a continental drift. The region where they met was full of plains on both continents, and the plains were surrounded by plateaus. Where the plains met, an impressive mountain range was formed (think of our world's Andes). A billion years passed... And the mountain range thinned. Also, those old plains are now beneath sea level. Those hitherto plateaus from a billion years ago are nowaday's plains and around sea level. You may tailor that mountain range's altitudes according to your wishes. Do you want it to be all above water? Possible. Some parts underwater allow passing, though you may need boats or bridges at some points. If the pass is in a region where water gets frozen, you get two options. Either ice forms on winters and bridges gaps between sunken mountaintops, allowing full passage without the aid of boats/bridges only when it's cold, or that ice is permanent and the passage is always open by land throughout the year. I would say your best bet would be a string of volcanoes along a fault line. The lava flow would spread out, and depending on the geography of the land, could be channelled into a road. You would need multiple volcanoes to get roads formed of that length. The good news is that volcanoes actually naturally form at or near fault lines. What if a coral-like organism grew especially well in the region where a river ran into the sea? Maybe it needs the nutrients from the river and something else (maybe the salt) from the sea. It forms a starter colony on either side of the river mouth. The colony directs the flow of water in more of a straight line than a delta, and allows the colony (in two almost parallel lines on either side of the flow) to grow out farther into the sea. As the colony grows, the column of water from the river continues farther and farther out. As the column of water is allow to continue mostly undiffused along this channel, the colony is able to grow and grow along almost straight lines. On top of these parallel columns of coral skeletons, colonies of other organisms grow, forming the base of the roads. In the last ice age this was the terminal edge of one or more or perhaps even successive gigantic sheet(s) of ice/glacier which dumped enough material at the leading edge to create a ridge which was either large enough to be above water when the ice age was over. Or had reefs built on it and sand deposited etc,. over millenia and eventually became a causeway. Unsure if this is actually possible but a global iceage where advancing glaciers came from north and south and that is where they eventually crashed into each other and deposited their moraines. Glacial tongue! Form a glacier between two parallel mountain ranges. Since there is stress on the ice when it leaves land and starts floating, the approach to the water needs to be a gentle slope. The general stability and length of the glacier then depends on the water and seabed. Traversing this bridge should be treacherous! Not the answer you're looking for? 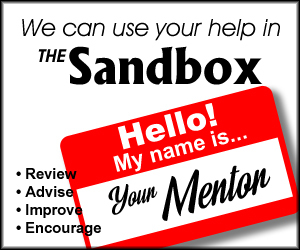 Browse other questions tagged science-based geology sea tectonics or ask your own question. What natural or artificial geographical structures that could allow a large-scale true “water going down the drain” whirlpool? Can I have a very dense asteroid belt ring around a star? How could you keep a rogue planet warm(ish)? Would a Roman civilization be willing and capable of building large scale sea defences against a serious but unrealised flood threat?